Take a deep dive into the issues shaping lives with Middlesex. Gain the essential knowledge to take your next steps in international relations, politics or law and get a grasp of the issues with real-world assignments and informative work placements. You’ll be supported by tutors whose research informs current policy while postgraduate study offers experience with organisations such as the United Nations. I have benefited greatly from my course. It's taught me how to be critical in my reading and analysis and conduct thorough research to find gaps in current knowledge. 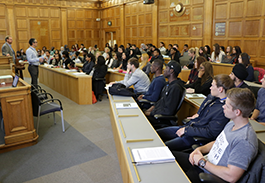 The Dean of School of Law, Joshua Castellino, explains why Middlesex University provides their postgraduate students with the skills, knowledge and confidence to be successful in the real world. We are in the top 300 worldwide for Politics & International Studies (incl Development Studies).